My origins are the YAMBA project smallholding, part of the family-owned Satemwa Tea Estate in Malawi’s fertile Shire Highlands. I am proud to be organically farmed without pesticides, among corridors of indigenous flora and fauna that enable wildlife to cross freely. I also pair beautifully with a health-conscious lifestyle. 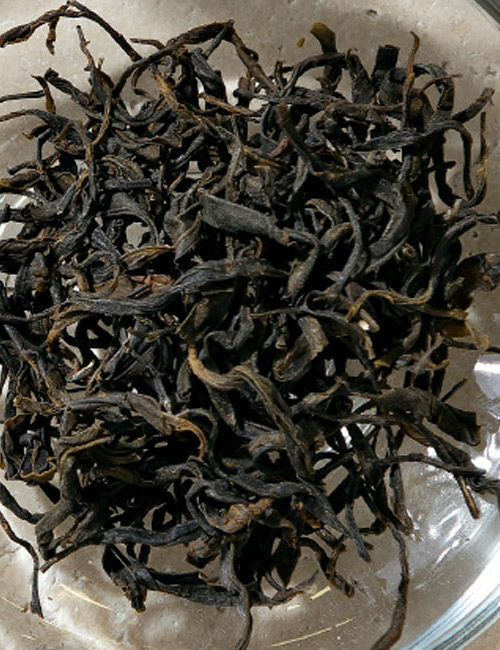 Ingredients: Large, whole Bvumbe Peony leaves (30G - 75 cups). Flavour: Light yet buttery, sweet and delicate. Aroma: Complex, intoxicating frangipani perfume. Health benefits: By nature, I am kind to your liver, kidneys, heart and general sense of well-being. 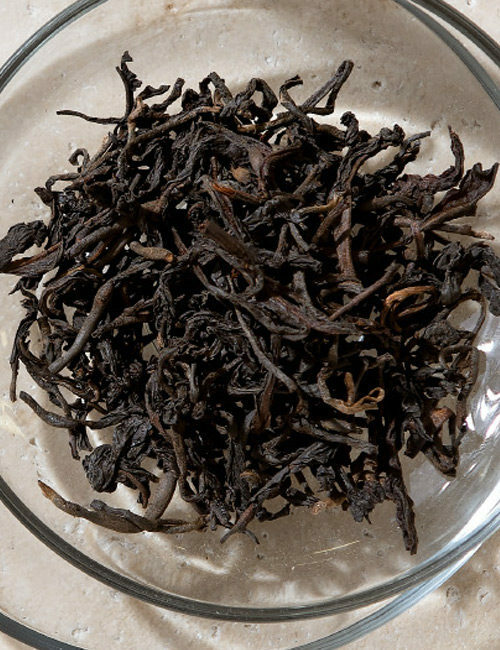 I’m from Bihar, India, where tea was not traditionally grown. In the ‘90s, tea farmers were invited here to boost the economy. 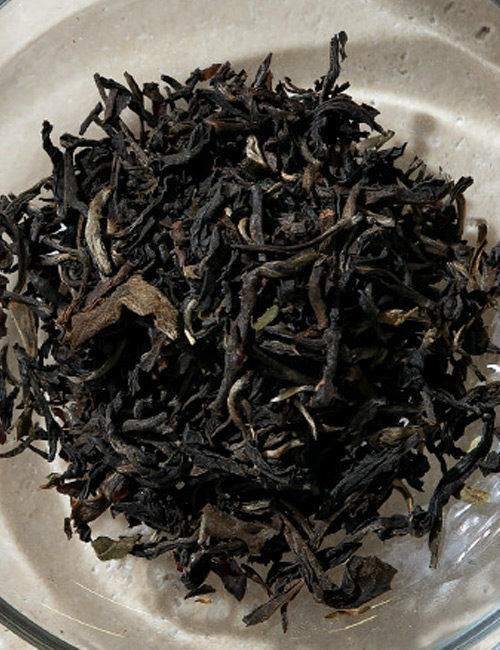 My plantation, the Doke Tea Estate, was one of the first. 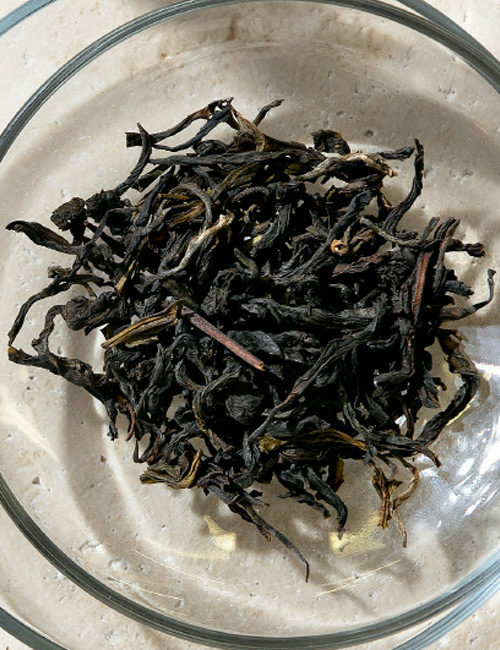 It soon began offering teas – like me – with a fruity aroma and refreshing flavour unique to the lush terrain. I’m farmed alongside the Doke River, where I’m shaded by trees with anti-microbial properties – no pesticides or herbicides required! 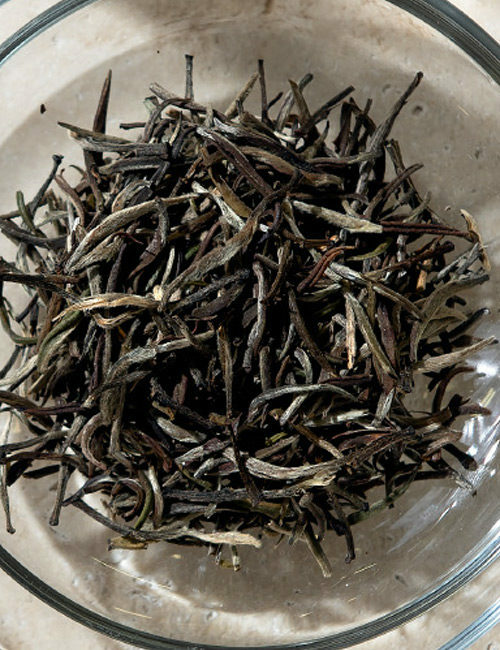 Ingredients: Fresh, young needle-shaped buds covered in a delicate silvery down. (30G - 60 cups). 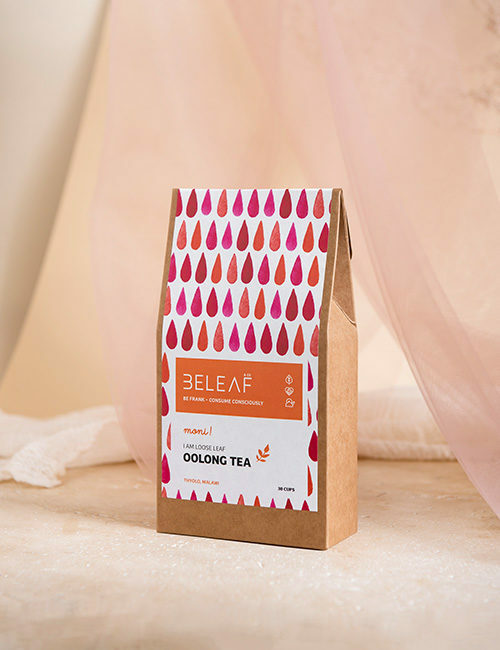 Flavour: Delicately sweet, creamy and full-bodied with hints of peach blossom and dried apricot. 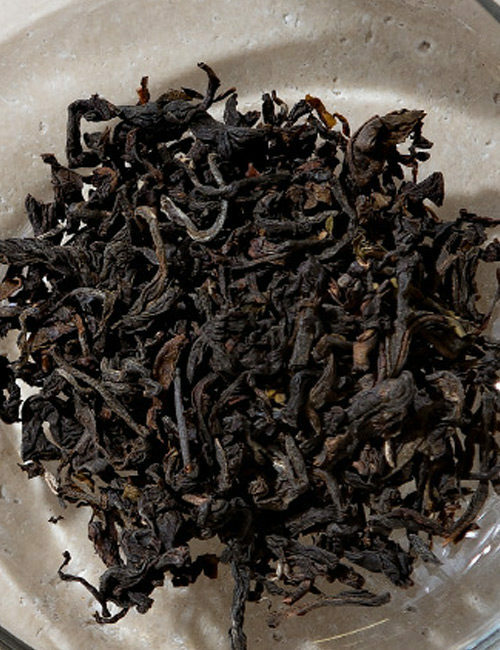 Aroma: Ripe stone fruit and fresh straw. Health benefits: I’m kind to your liver, kidneys and heart. 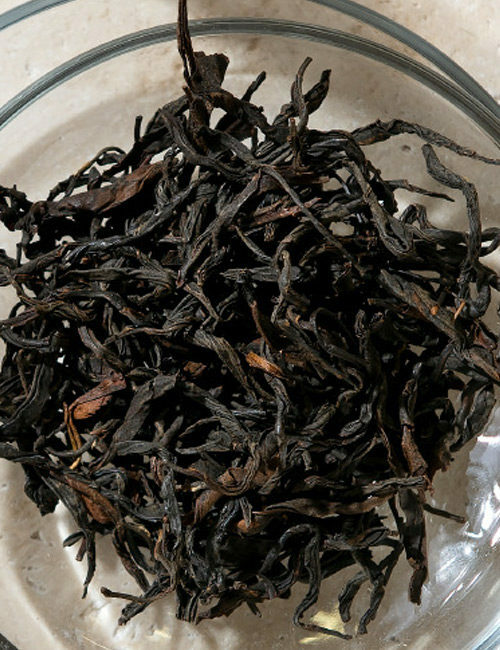 Ingredients: Large, beautiful whole tea leaves, 100% oxidised and hand-rolled. (40G - 80 cups). 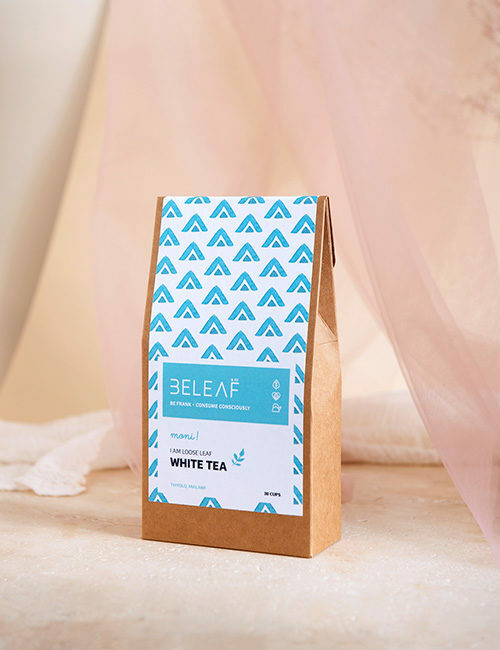 Ingredients: Whole tea leaves. (40G - 60 Cups). 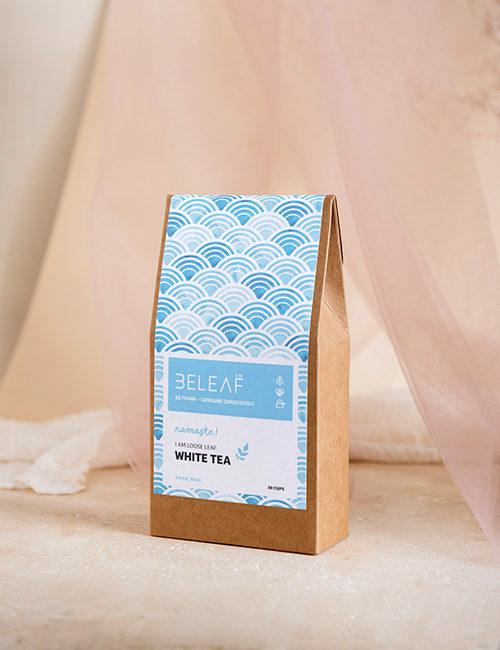 Ingredients: Whole tea leaves, lightly fermented. (40G - 40 Cups). 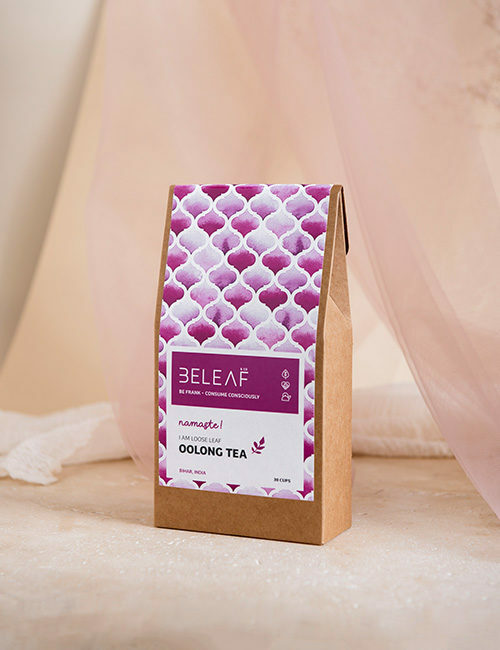 I’m sourced direct from Neelamalai Organics, a small, family-run tea estate in the Nilgiri Mountains, one of the most biodiverse regions on the planet. Here, I am organically grown in the rich volcanic soil using traditional Indian techniques to keep pests at bay and bring out a fruitier, earthier flavour in my leaves. 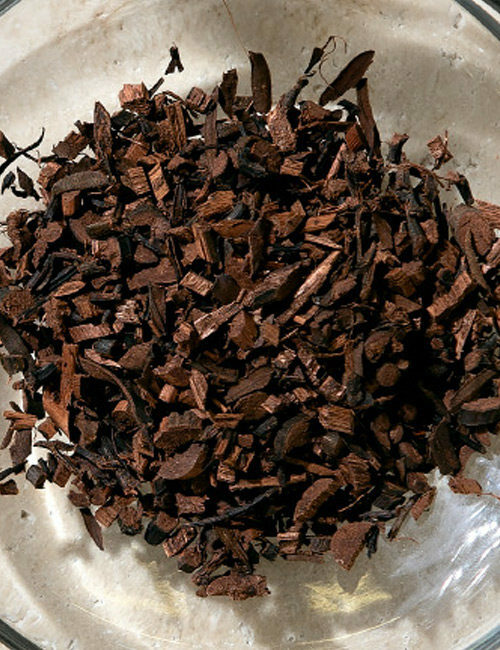 Harvested by hand, I’m dried using renewable sources of wood and processed in small batches to preserve my natural properties. 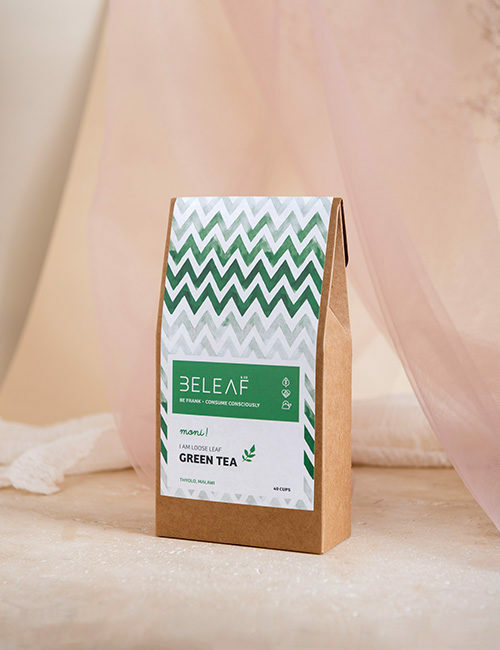 Ingredients: Whole, rolled green tea leaves. (40G - 60 Cups). 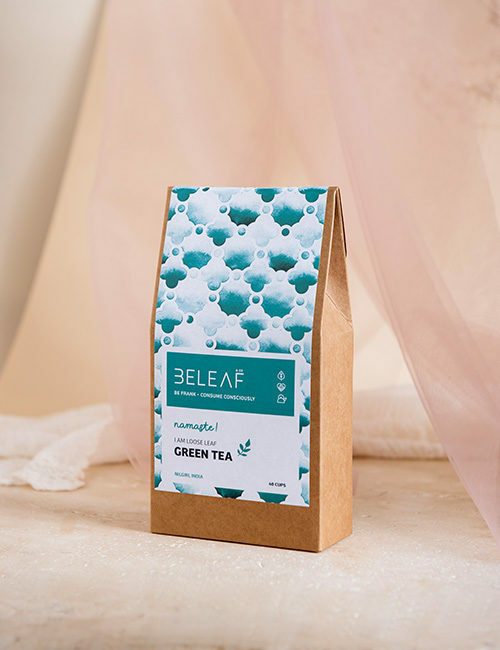 Flavour: Light, refreshing green tea with hints of mint. 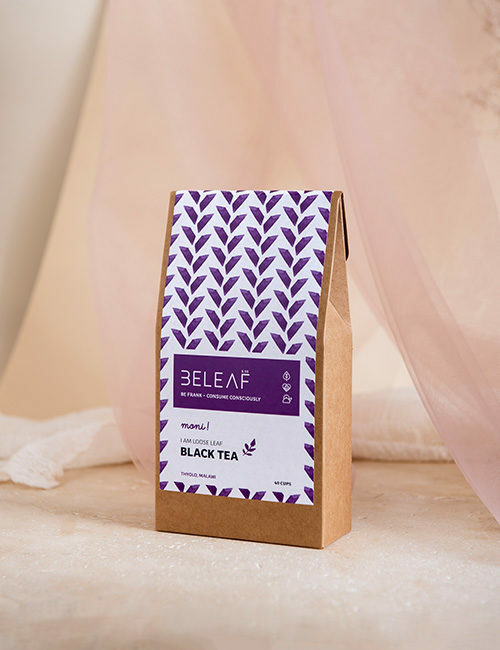 Aroma: Fresh and invigorating, with subtle notes of liquorice. Health benefits: I’m kind to your heart and skin. 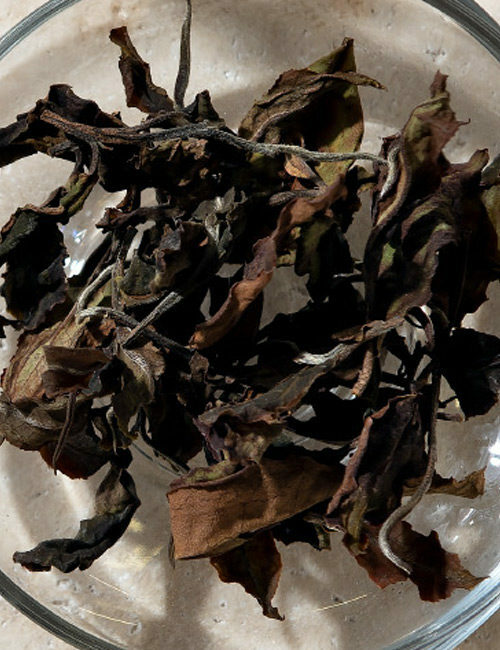 Ingredients: Hand-rolled leaves, lightly oxidized. (30G - 30 Cups). 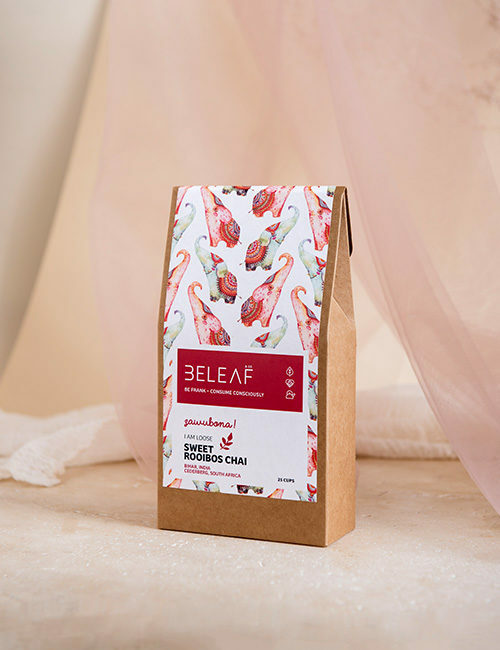 I have layers of flavour and uncomplicated origins: I’m sourced direct from two small tea gardens and blended by Beleaf & Co. My soothing rooibos comes from the only place in the world where this fynbos plant grows naturally (Cederberg, South Africa). 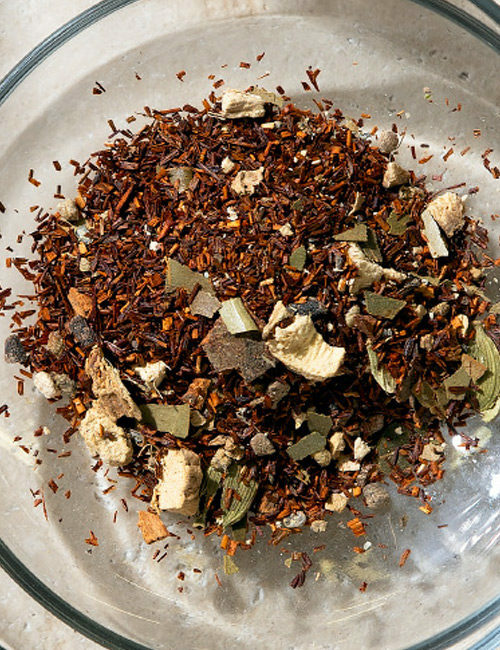 My warm, zesty chai hails from a nature-loving tea and spice farm on the banks of the Doke River (Bihar, India). Flavour: Sweet, spicy and subtly wooded. Aroma: Fresh wood and honey with a bouquet of spices. Health benefits: I’m gentle on your digestive system and boosts your sense of wellbeing. Named after the scent of my flowers, I’m pure honeybush (cyclopia longifolia) – a fynbos plant and not strictly a tea. Years ago, people made “blommetjiestee” (flower tea) from the honeybush, but now I’m harvested before I blossom for the best flavour. I grow organically along the Garden Route in areas where I add value to the coastal ecosystem. Once plucked, I’m gently fermented and processed to retain my flavour and healthy-giving properties. Ingredients: 100% honeybush. (50G - 25 Cups). 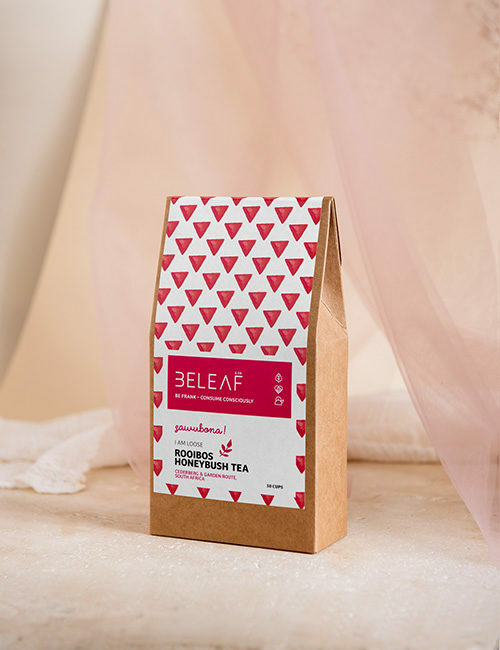 Flavour: Fruity and woody with delicate, naturally sweet notes of honey. Health benefits: They say I boost the immune system and lessen inflammation. 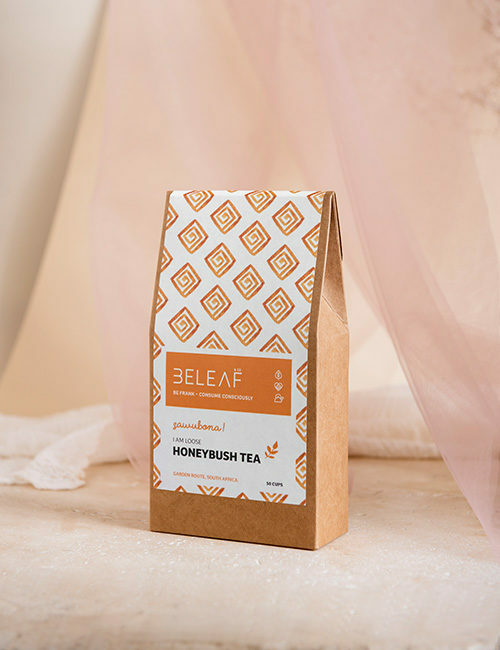 Ingredients: 100% rooibos blended with pure honeybush. (50G - 50 Cups). I am not strictly a tea, but rather a fynbos plant that grows in the wild Cederberg region of South Africa. 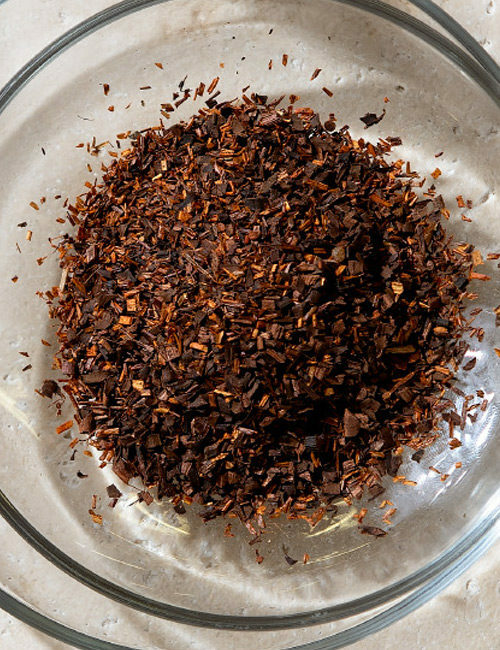 This is the only place on the planet where rooibos flourishes naturally, a vital part of a unique indigenous ecosystem. 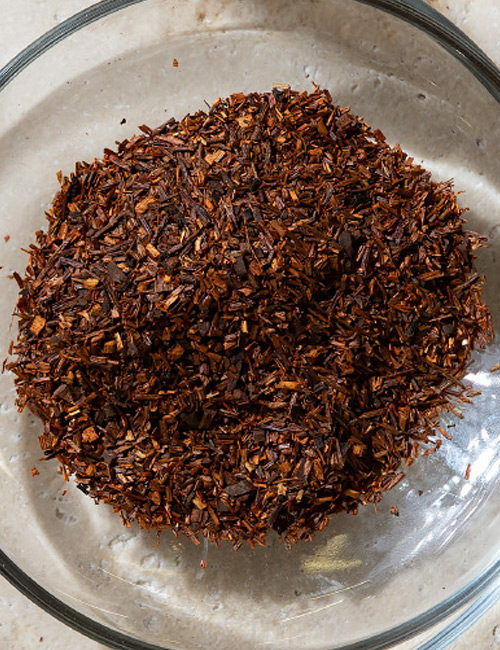 Here, locals have passed down knowledge about growing and crafting the finest, environmentally-friendly rooibos for generations. I’m farmed with solar power and collected rainwater. 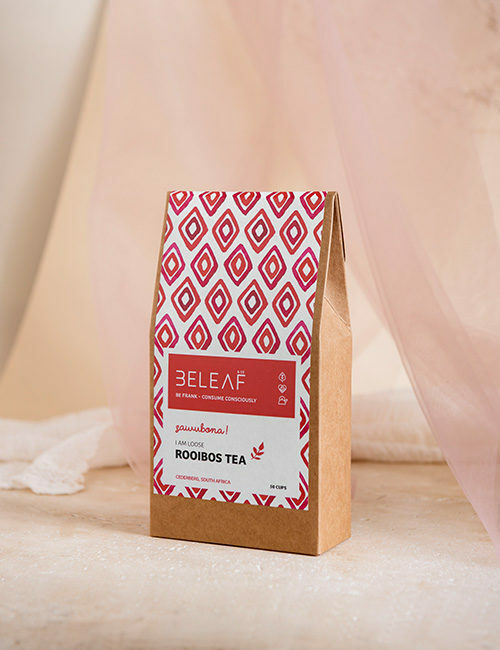 Ingredients: 100% rooibos. (50G - 50 Cups). Flavour: Subtly sweet with hints of earthiness and light tobacco notes. Aroma: Warm honey with earthy tones. Health benefits: I’m also 100% organic and good for you, offering anti-aging and allergy-fighting properties.